Whomp whomp. 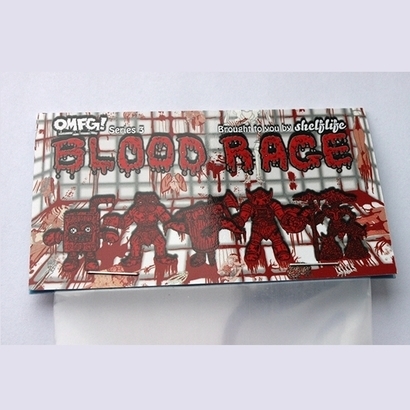 There're no OMFG Blood Rage (ShelfLife Exclusive)s for sale. The translucent red edition of the OMFG Series 3 figures by October Toys was released here as a ShelfLife.net exclusive. The set matches the Blood Rage releases for Series 1 and Series 2. Series 3 features five new designs to collect: DR. DECAY by Jonathan Wojcik & George Gaspar; BARBARIANAUT by Charles Marsh; PUGNACIOUS by Bill MacKay & George Gaspar; FRUIT PUNCH by Scott Tolleson & George Gaspar; and TENCAN by Richard Brown, Nikolos Sardos and Bryan Fulk. A strong new entry in the OMFG product line. Great new characters in the tradition of M.U.S.C.L.E. and their ilk.